Sold in February 2015, the 50 metre Benetti superyacht Aquila is back on the market, renamed Blue Night and listed for sale by Burgess. Designed by Stefano Natucci and built in steel and aluminium by renowned Italian superyacht yard Benetti to ABS class, Blue Night was delivered in 2000 as the fifth yacht in the yard's Golden Bay series and was refitted in 2013. Her interior, also by Stefano Natucci, is in honey coloured oak burl complemented by 100 per cent pure wool custom carpets throughout. Just inside the main saloon are two large L-shaped sofas, an armchair and a glass topped, intricate metalwork coffee table. Opposite the sofas is a 50-inch home theatre television and entertainment centre. 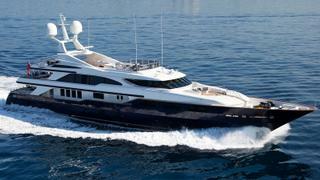 MCA compliant, accommodation on board this yacht for sale is for up to 12 guests in five cabins. The master suite is full beam on the main deck and has a king-sized bed, 42-inch television screen and large windows allowing in plenty of natural light. Below deck, there are two identical doubles with queen-sized beds, a twin and a triple cabin. The vast sun deck features sweeping deck spaces which can be used as relaxation areas or for guest entertainment. Forward is a very large, raised sunpad area with unobstructed 360-degree views while midway is a large Jacuzzi, adjacent to the marble topped wet bar with two fridges and a barbecue grill. Under the radar arch is a large dining table with five chairs on one side and fixed cushioned bench seating on the other. Her top speed is 18 knots and she boasts a maximum cruising range of 3,200 nautical miles at 14.5 knots with power coming from two 2,262hp MTU 12V396TE94 diesel engines. Lying in Turkey, Blue Night is asking €10,950,000.